It is estimated that about 50 percent of those diagnosed with lupus develop kidney problems. In the context of lupus, kidney problems are called lupus nephritis. With lupus nephritis, you might have symptoms of high blood pressure, foamy urine, and swelling of your feet. This article helps you understand this condition and its epidemiology, cause, signs and symptoms, diagnosis, treatment, and complications. Lupus nephritis more commonly affects adult women than men; however, men typically have a worse prognosis. It is reported most frequently in black individuals, followed by Asian and Hispanic. Kidney complications are least likely to develop in white individuals. Lupus leads to the kidney damage characteristic of lupus nephritis. In lupus, the body’s own immune system attacks its own cells and organs, including the kidney. Both genetics and the environment play a role in who develops lupus nephritis. Lupus and its kidney complications are more common in first-degree relatives with the same condition. On the other hand, research on identical twins with lupus has found that sometimes, only one twin will develop the condition. This suggests certain environmental factors may cause this complication, however the environmental factors remain unclear to scientists. Under a microscope, pathologists can see lupus nephritis, even if you do not have any symptoms. In fact, you might not have any symptoms at all. Often, your healthcare provider will discover this kidney problem during a routine physical exam and blood test. For this reason, it is imperative to attend all your regular check-ups. Your healthcare provider will conduct a thorough medical evaluation to diagnose lupus nephritis. They will complete a physical exam and ask you some questions about your symptoms. For example, they may ask if you have foamy urine or if you wake up at night to urinate. They will also complete blood work and ask for a urine sample. They might request a kidney biopsy as well. During the evaluation, your healthcare provider will be looking for classic signs of kidney damage: protein in your urine, swelling in your lower legs, too little protein in your blood and high cholesterol. If your healthcare provider suspects this kidney complication, they might conduct a renal biopsy. Once you’re diagnosed with lupus nephritis, your physician will stage the damage to your kidneys using a staging system. Originally, the World Health Organization created a staging system in 1963. This system was revised in 2003 by the International Society of Nephrology and the Renal Pathology Society. The overall goal of treating lupus nephritis is to normalize your kidney function and prevent further damage. Your healthcare provider will teach you strategies to manage your symptoms, and they will prescribe medications. There are several stages of lupus nephritis, and the treatment will depend on the stage of nephritis, as well as the type of lupus. In addition, each person has specific symptoms – treatment is also aimed at reducing symptoms. Corticosteroids. These medications have anti-inflammatory properties and reduce inflammation in the body – thus they will reduce inflammation in the kidneys. They can be used until inflammation improves. Their use should be monitored carefully, as they have a long list of side effects. Once symptoms of nephritis begin to improve, corticosteroids are tapered, or reduced. Immunosuppressive drugs. These are similar to the medications that are used to treat cancer and prevent rejection of transplanted organs. They work by reducing the immune function of the body, which may be damaging the kidneys. Examples include cyclophosphamide (Cytoxan), mycophenolate (Cellcept), and azathioprine (Imuran). Blood pressure medications. Medications that may reduce blood pressure and blood clots may be prescribed. If you are diagnosed with this condition, you should avoid over the counter NSAID medications like ibuprofen, aspirin, diclofenac, and naproxen because these can harm your kidneys. Most of the time, swift and effective treatment can control lupus nephritis and reduce your risk of complications. However, not everyone responds to treatment. The most severe form of lupus nephritis, diffuse proliferative nephritis, commonly leads to kidney failure. About 10 to 30 percent of patients with this condition may later develop kidney failure. 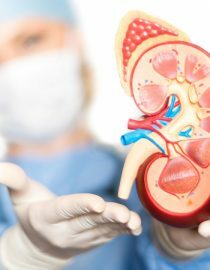 Kidney failure is also called end-stage renal disease, and it requires aggressive treatments like dialysis (where a machine helps filter harmful substances out of your blood) or a kidney transplant. People diagnosed with this condition are also at risk of developing B-cell lymphoma, a type of cancer that begins in the cells of the immune system. Systemic lupus erythematosus is a disease where the body attacks its own healthy tissues. Lupus nephritis occurs when the body attacks the kidneys. The cause of SLE remains unclear. Most people who require dialysis will eventually require a kidney transplant. Dialysis is the first-choice treatment for kidney failure, but it isn’t a permanent treatment. A kidney transplant is ideal, but it can take months – or even years – to find a donor. It may seem as if we’ve painted a grim picture for those with this kidney condition, but the outlook varies. Most people actually experience only intermittent symptoms. Plus, there is a lot that you can do to prevent further damage from occurring and protect your kidneys. Stop smoking! If you don’t have another reason already, here is a big one. Quitting smoking can protect your kidneys. If you don’t smoke – don’t start! Eat a low-sodium diet. This is especially important if you have hypertension. Ensure that your blood pressure is adequate. Dr. Melissa DeCapua is a board-certified psychiatric nurse practitioner. She currently works as a consultant for small healthcare technology companies, and she was recently won the Seattle Health Innovator award.